In the right position Streptosolen jamesonii or ‘Marmalade Bush’ is a free flowering hardy plant. Grown for the masses of orange to yellow flowers (they change colour as they age) that appear over long periods, it is easy care and problem free. They will grow in part shade to full sun and will flower well with their trumpet shaped blooms adding colour to the garden. If you are planning to use them as a hedge, try spacing them at around 1 metre apart. This is a species that requires a warm climate to thrive. They are from south America and grow naturally as a woodland plant. Try planting in morning full sun with a little afternoon shade, or good dappled shade. Soil moisture is required for good growth, mulch around the plant to help maintain a cool moist root run. Tip pruning each year will keep them in good shape with a nice bushy habit. Best grown part to full sun or dappled shade, depending on the climate..
Top dress with well rotted compost and aged cow manure in late winter. Use a liquid seaweed fertiliser through spring. A general purpose slow release fertiliser is also suitable. 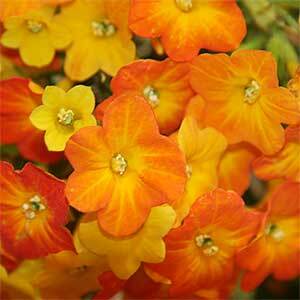 Flowers – Bright Marmalade Orange to Yellow. Flowering time – Almost year round in the right conditions..